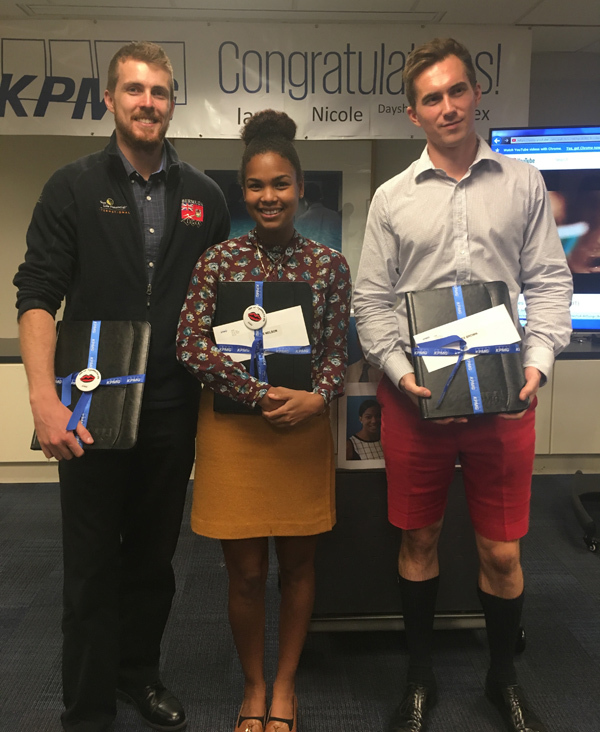 KPMG in Bermuda said they are “delighted to announce the successful qualifications” of Nicole Nelson, Ian Bucci, Alex Brown and Dayshalae [Smith] Williams as CPAs. Mike Morrison, CEO of KPMG in Bermuda, commented, “With Nicole, Ian, Alex and Dayshalae joining our ranks as qualified accountants, we are developing Bermudian students to be future leaders of the firm or in industry across the island. The company said, “KPMG has three robust programs in place, managed and supported by Wanda Armstrong, Senior Manager, Human Resources. The first is our Summer Intern/Co-Op Placement Program where employment is offered to a select group of Bermudian undergraduates [12 week period for interns and 4-6 months for University Co-Op Placement]. “The second program is our KPMG Scholarship Program whereby an award, valued at $20,000 per annum for three years is awarded to a Bermudian university student interested in pursuing a career either as a Chartered Professional Accountant, a Certified Public Accountant or an Associate Chartered Accountant. “Many of our interns and scholarship recipients then continue on to take part in our Graduate Trainee Program where they join us as full time employees and are supported with on the job training, mentoring as well as sponsorship of their further education towards their accounting designation. All three of the programs are available through an application process. “During 2017, we employed 15 interns and we look forward to having a greater number in 2018. We currently have 18 Bermudians in our Graduate Trainee Program. “Nicole joined KPMG in Bermuda after graduating with a First Class Honors Business with Economics degree from the University of the West of England. She plans on taking time off for travel then will be joining our office at KPMG in the UK in the fall,” the company said. “Ian joined KPMG in Bermuda’s Enterprise department in the summer of 2014. He is a graduate of Acadia University with a Bachelor of Business and Administration and previously worked at KPMG on three different occasions as a Co-Op intern before being employed full time as a member of our KPMG Enterprise Audit team. Ian is considering options for an overseas placement with KPMG in New Zealand. “Alex is a member of our Advisory team, joining KPMG in Bermuda as a Graduate Trainee within the Advisory department at the start of 2016. He studied Mathematics at The University of Durham and successfully achieved an Upper Second-Class Honors degree. “Dayshalae joined KPMG in Bermuda in July 2014 after completing three years of education in the UK and a one year placement with KPMG in 2012 with our Audit insurance department. “Through KPMG’s support, Dayshalae is currently studying for her Masters in International Accounting and Finance at the University of Birmingham and will be taking up employment with our KPMG Birmingham UK office as a Forensic Accountant once she graduates in 2018. Dayshalae is scheduled to return to KPMG in Bermuda in 2020. “It is wonderful to see our graduates continue on to become qualified accountants. It takes on an additional significance when we are able to support the growth of Bermudians,” added Stephen Woodward, Managing Director and lead of the KPMG Student Programs.